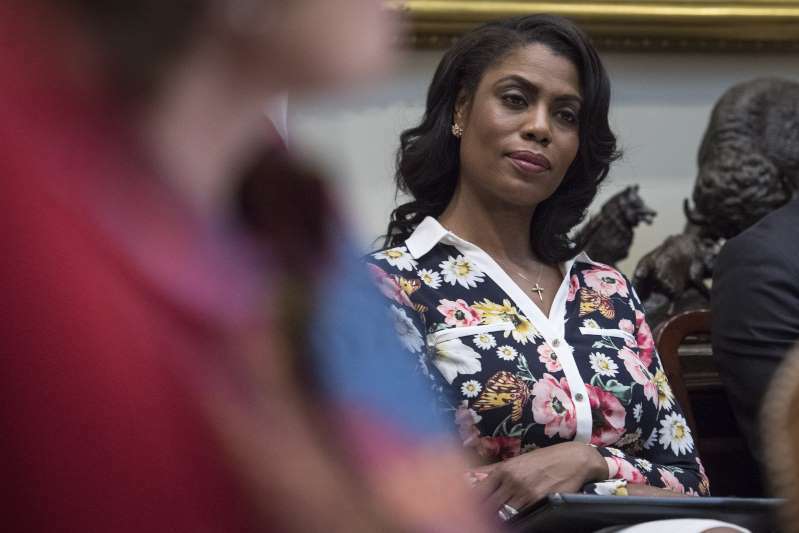 Omarosa Manigault Newman, aide to President Trump, attends a meeting with parents and teachers in the Roosevelt Room of the White House on Feb. 14, 2017. To Trump, this should come as no surprise. After all, Manigault Newman perfected her flair for the sensational, her cult of personality and her savvy use of media while apprenticing for the master himself: Donald J. Trump. [post_ads]The Omarosa of popular imagination is in large part Trump’s creation, and that creation is wreaking havoc on the White House. Manigault Newman’s controversial allegations, some of which are not verified, have rattled the president and thrust his aides into damage-control mode. The Trump campaign said Tuesday that it was seeking to force the former staffer into binding arbitration under the terms of a 2016 confidentiality agreement that the campaign claimed her book violated. Manigault Newman, who held a senior staff position in the White House until she was fired in December 2017, said she did not believe she had violated the contract. Meanwhile, White House press secretary Sarah Huckabee Sanders struggled to defend Trump on Tuesday against charges of racism. Pressed about whether she could guarantee that there is not a recording of Trump uttering the n-word, as Manigault Newman asserts, Sanders said, “I can’t guarantee anything,” though she said she had “never” heard Trump use the racist slur. The image of the White House press secretary unable to unequivocally state that the president has never uttered the most unacceptable racial slur felt like it could have been a reality television cliffhanger. In a way, it was. Trump discovered Manigault Newman during the first season of his NBC reality show, “The Apprentice,” as a fully formed antiheroine. He quickly realized her particular brand of mischief-making narcissism was a ratings bonanza. And she returned for two spinoffs, as well as a short-lived dating show collaboration. Trump, who at the time was trying to make the move from tabloid curiosity to full-blown celebrity, was mesmerized by how well audiences responded to Manigault Newman as a captivating character, according to Trump biographer Timothy O’Brien, who says he had several conversations with Trump about Manigault Newman. In her, Trump saw a reflection of himself. Manigault Newman followed Trump into politics. During the 2016 campaign, she was one of Trump’s most steadfast defenders against accusations of racism and sexism — the very charges she is now leveling against him. Then in the White House, she reprised her role as villain, feuding with West Wing staff and allegedly shirking her duties before she was dismissed by Chief of Staff John F. Kelly. And now, like in the “Jurassic Park” film series — in which the dinosaurs turn on the scientists who created them — Manigault Newman has unleashed Trump’s own tricks and tactics against him. The answer, for now at least, is tweet. But Trump has shown no such restraint. Longtime Trump observers say it is a measure of his rage and sense of betrayal that he called Manigault Newman “that dog.” The president, who has an aversion to dogs and other pets, considers canine comparisons to be among his most devastating put-downs. Some who have appeared most effective countering Trump are those who employ his tactics, such as Michael Avenatti, attorney for adult-film star Stormy Daniels, and Michael Cohen, the president’s former lawyer now under federal investigation. They are relentless and omnipresent. They create drama, hold news cycles hostage and dribble out tantalizing nuggets. In the case of Cohen as well as Manigault Newman, they have secret audio recordings, too. A central irony is that while Trump in real life often intimates he has secret recordings, he rarely, if ever, publicly produces them. While some in his orbit believe he has actually recorded conversations, others believe his threats to deploy them are mere bluster and intimidation. But some of his associates have, in fact, done as he claimed. “If you threaten people long enough with the notion that you’re going to tape them, they themselves are going to start taping you, because they believe at some point you’re going to throw them under the bus and they’re taking out an insurance policy,” said O’Brien, who also is executive editor of Bloomberg Opinion.